December's finally here, so I think we can go ahead and start eating Christmas-type cookies without feeling like we've jumped the holiday gun. This blog has certainly seen a couple of successful peppermint cookies and other treats. But in general, I'm starting to feel like I'm simply not a fan of pepperminty desserts. I want my candy canes separated from my baked goods. 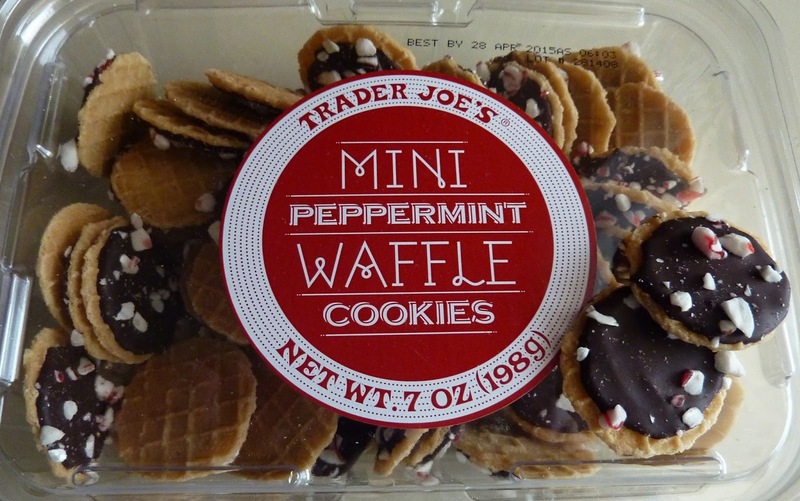 First impressions: they remind me of other miniature waffle cookies I've had in terms of size and texture. But these little guys have the added crunch of candy cane bits. Not a huge fan of biting down on hard candy (but my dentist loves it because he gets richer every time I do it). There's a good bit of chocolate here. In fact, according to the ingredients, there's more chocolate going on than waffle. And my inner-alcoholic absolutely loves that the number one sub-ingredient is chocolate liquor. Between the liquor and the mint, it's a bit like rinsing one's palate with a festive holiday mouthwash. But seriously though, there really is a nice little chunk of chocolate on every piece, which makes these tiny cookies rich and serotonin-inducing, if not delicious. The waffle element is crispy enough, and I suspect these cookies are fairly stale-resistant. If I ever have grandchildren, when they come to visit, I'll put stuff like this out in a little dish on the coffee table the way my elders did with red and green M&M's at Christmas time. I mean, maybe if I were 7 again, I would want to shovel these things down by the handful, but I think for most people they're just going to be a "one here, another there" type of holiday mood-setting appetizer more than an actual dessert or snack. Sonia was happy that she had minty-fresh breath after consuming these wintery treats, but she wishes the waffles were thicker. She gives them 3.5 stars. I give 'em 3. 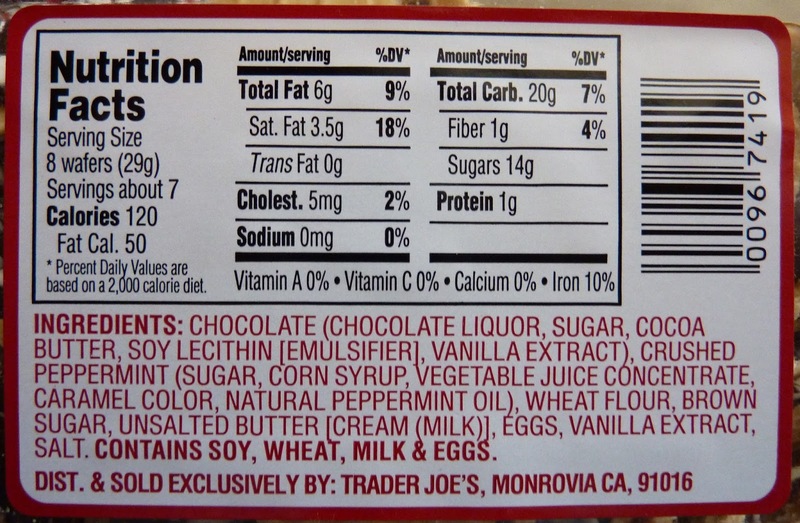 Interesting food chemistry note - "chocolate liquor" is what is created when the cocoa nibs are ground up and pressed. Nothing to do with alcohol whatsoever. The liquor is then combined with some sugar and fat and heated, and then you end up with what is recognizable as "chocolate." Hope that doesn't dampen your enjoyment of the cookies! Ha ha Nathan...we're glad you don't do "fact checking" because your readers will do it for you...we love catching mistakes LOL! I also read the Smitten Kitchen blog and the comments are always full of corrections and clarifications...everyone is very nice about it, of course. Do you remember how much these cost? I think it was $3.50. It's funny how subjective this is… these are one of my yearly favorites!! Don't worry - you didn't dampen my enthusiasm for them :) Thanks for all your fun posts, though! You're right, Kristine. It is very subjective. That's why we value your comments. They help make our blog more rounded and complete :) Thanks for sharing your opinion!